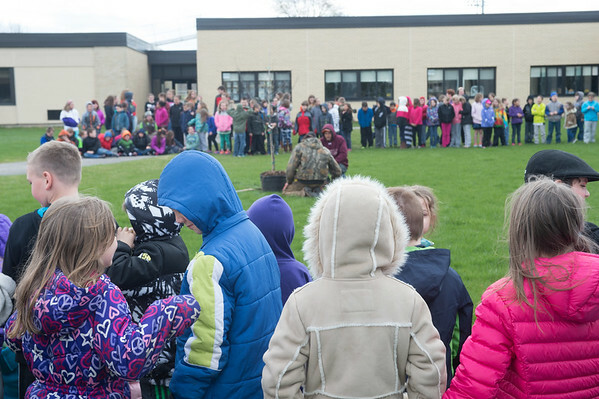 JOED VIERA/STAFF PHOTOGRAPHER-Lockport, NY-Students at Royalton-Hartland Elementary School celebrated their second annual Arbor Day Tree Planting Ceremony. During the ceremony, the children planted an American redbud tree. Members of the Royalton-Hartland FFA Chapter discussed the importance of Earth Day and Arbor Day. While the tree was being planted, the entire elementary school sang the "Tree Song" and "Plant a Tree for Your Tomorrow." Each student in grades Pre-K to four also received a blue spruce seedling to take home and plant courtesy of the Niagara County Soil and Water Conservation District and the Royalton-Hartland Elementary School PTA. As part of the celebration, the FFA Chapter will visit the classrooms to teach the students how to plant their seedlings.